Opencart Google Plus Feeds : Take the opportunity to give your followers something exclusive. Whether it is exclusive news, content, reviews, offers or competitions, giving them something that can’t be found anywhere else will create a buzz around your Google+ page, to increase customer engagement & sales conversion. Opencart Google+ feeds automatically syncs your google+ account and will display the feeds & posts on your website. 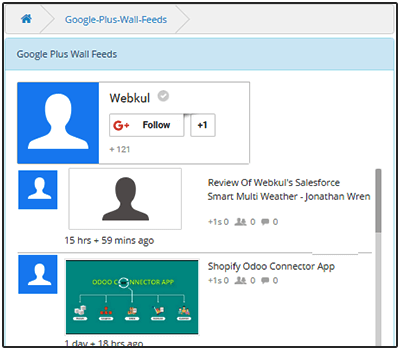 Opencart Google Plus Feeds - Take the opportunity to give your followers something exclusive. Whether it is exclusive news, content, reviews, offers or competitions, giving them something that can’t be found anywhere else will create a buzz around your Google+ page, to increase customer engagement & sales conversion. Opencart Google+ feeds automatically syncs your google+ account and will display the feeds & posts on your website. Compatible with all modern browsers (IE7+,FF,Chrome etc.). Allows the user to display their feeds or posts from their Google+ profile or page. Physical dimensions like height & width of the Google+ box can be adjusted from admin panel. Option to enable/ disable for showing comments. No. of comments to be displayed on the frontend can be adjusted. Options like Avatar & Media images can be enabled from backend. Like or Recommend button can be shown. Background color of the Facebook wall can be adjusted. Enable comments & No. Of comments to be displayed. Showing Avatar & Media Image. Physical characteristics like Height, Width & Background Color. The Opencart Google+ extension allows you to display posts from your Google+ Page/ Profile. This module provides social media integration in your e-Commerce store to increase customer engagement & sales conversion. Grab your Google+ posts automatically. Displays Media Images & Comments. 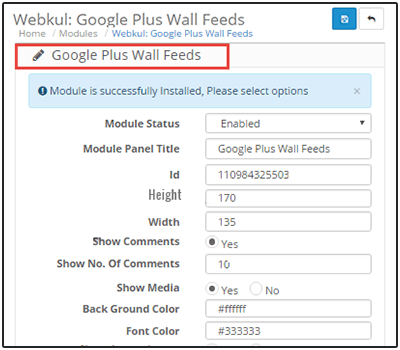 Did you buy Opencart Google Plus Feeds?